Do you know that you can now Pay Electricity Bills Online in Nigeria? Here is an article that will tutor you in the easy steps to take to Make your Payments at www.payelectricitybills.com without stress. You can Simply make Bill payment from the comfort of your own home, Read on to See How. You can make payments for your electricity bills and purchase tokens for your prepaid electricity meter without having to go to the bank. With your Mobile device or PC, your ATM Card, Phone Number and your Email Address, You can now make payments just from the Comfort of your home as long as there is a good internet connection. To Make use of the portal, You have to carefully follow the Steps given in this article. 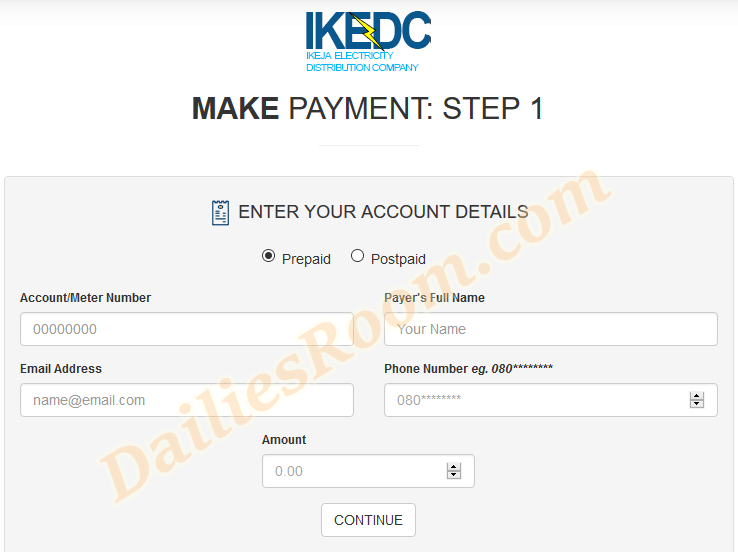 A new Page Comes On; Fill the Details Correctly – Account/meter number, Payer’s Full Name, Email Address, Phone Number, Amount. Now enter the meter token you received into your prepaid meter followed by the hash # key and your prepaid meter will be credited with the amount that was paid. With the steps above, you have successfully paid your electricity bills. Let other people know about this easy steps to Pay Electricity Bills Online At www.payelectricitybills.com by sharing this article on your Social Media Account and for any question on this article, feel free to use the COMMENT Box Below. And get your service sharp. It is Safe, Reliable and Convenient.